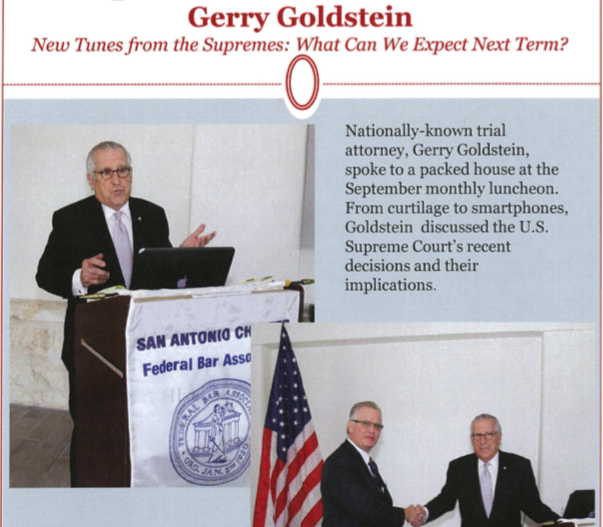 Gerry Goldstein is a nationally renowned criminal defense trial attorney who has argued before the United States Supreme Court and testified before congress. 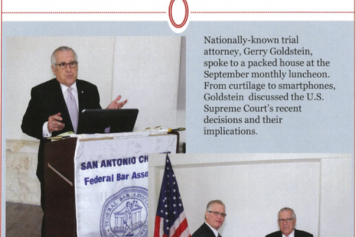 It is no surprise then that Goldstein’s speech regarding the Supreme Court’s recent decisions at the September Luncheon of the Federal Bar Association would be to a packed house. 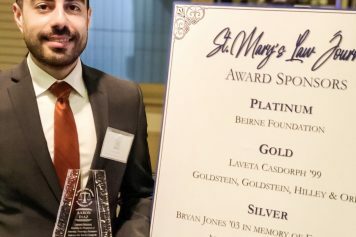 Goldstein, is after all, nearly unmatched in his litigation experience having recently been given the Texas Bar Foundation’s Outstanding 50 Year Lawyer Award. Mr. Goldstein’s speech covered several Supreme Court decisions including the expansion of protections against warrantless searches of curtilage areas of a person’s home as well as the requirement of a warrant to search a person’s smartphone. Goldstein also discussed future implications of the decisions and what we can expect from the Supreme Court this year. The Federal Bar Association (FBA) is a national organization founded in 1920 for attorneys who practice federal law. The FBA’s stated purpose is the “advancement of the science of jurisprudence and to promoting the welfare, interests, education, and professional development of all attorneys involved in federal law.” The FBA furthers this purpose through advocating to improve the federal legal system, holding networking events, and by conducting legal education courses. The Federal Bar Association luncheons help to cover all of the bases for advancing the FBA’s interest in federal law and the development of federal attorneys. FBA luncheons allow attorneys to network, discuss the law, and to be learn about what is going on with the FBA and changes to the law at the federal level.